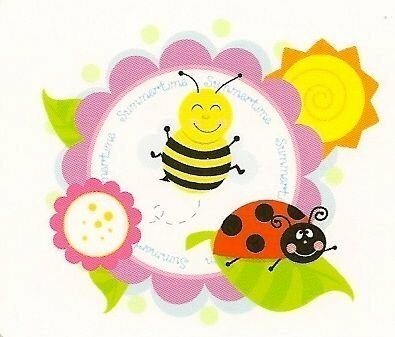 Everyone loves Ladybugs; they're bright and shiny with black polka dots over a red outer shell (Their wings). Probably they're the only bugs little girls aren't scared of. That's the reason many of them wish to have a Ladybug themed birthday bash. 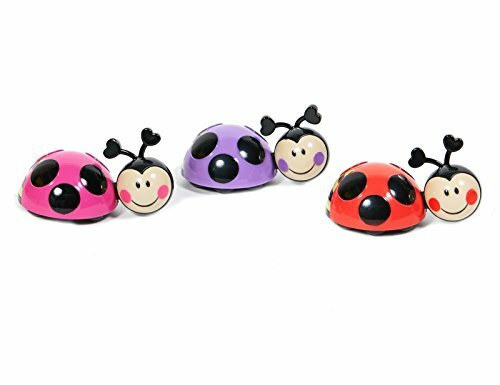 But, in order to decorate your cake in accordance with this lively theme, you're going to need some beautiful Ladybug Cake Toppers. Some toppers are not edible and your kids would enjoy playing with them for months to come. 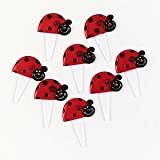 So, let's take a look at some of the options available when it comes to Ladybug cake toppers for regular as well as cupcakes. 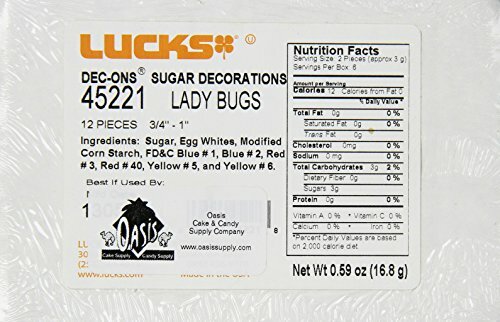 If you're not an artist or just don't have the time to create beautiful Ladybug pictures on the cake you bake or buy from a bakery, you should consider placing Ladybug Figures on top of the cake to make it look fancy. This way the birthday note that's present on the cake won't get covered up. There are edible cake toppers that you could consider as well, but if you want to place a personalized message they aren't always the best option unless you're gifted and can write beautifully with icing. Take a look at some of the possibilities to your right. Note that only the ladybugs are included and the cake would have to be your own. 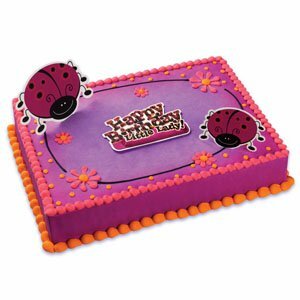 As you can see, the second one in addition to two ladybugs also includes a plaque that reads - "Happy Birthday"
Ladybugs are really pretty and they're a great way to decorate your child's birthday cake. But, wouldn't it be great if you could customize and add your very own beautiful cake toppers? Zazzle is a popular print on demand site that manufactures high quality products based on art created by just about anyone. However, some of them stand out amongst the rest and make really pretty toppers. The text on them is customizable and hence you can add you're child's name as well as age or just about anything that you wish to say. The second one is really amazing and would work well for single as well as your twins birthdays. Cake toppers are nothing but cake decorations, they're basically used so as to convert the cake into something based on a theme - in this case it's ladybugs. The best Cake Toppers are edible, because they're made of tasty icing - kids love it! Especially, children with a sweet tooth. 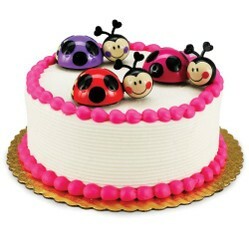 The edible ladybug cake topper shown below works well on any 1/4 sheet cakes as it measures approximately 7.5X10 inches. Each pack comes along with instructions so as to help you make the best use of it. Basically, all that you need to do is separate the topping from the baking sheet and place it on your cake about half an hour before the cake is cut. This will give it time to melt a bit and fuse with the cake - making it seem like a single piece. 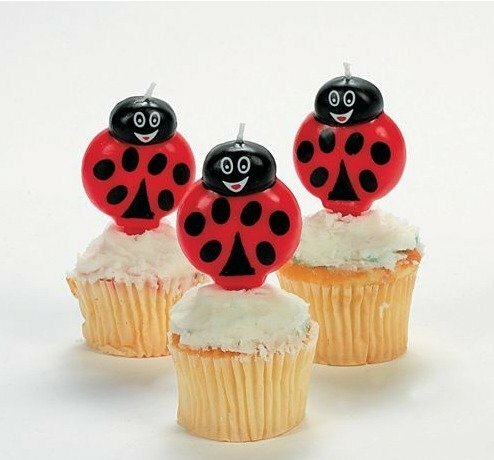 Usually kid's parties serve delicious Cupcakes rather than a huge party cake, therefore, there's a huge range of choices when it comes to Ladybug Cupcake toppers. This special topper that is also a candle looks really pretty. Light them all up whilst you sing and wish the birthday girl. But, make sure to turn them off before the kids are allowed to grab one for themselves. Very often cakes have a lot written on them and when you get a cake baked at a bakery, they would even decorate it with beautiful flowers made completely out of icing. I love these. I'll have to tell my daughter about it. It's kind of a theme for my granddaughter. When she was pregnant with her, she asked my grandson what they should name the baby. He said ladybug, so she loves buying ladybug items for her. I'm going to forward this to her.